A recent construction site accident wrongful death Los Angeles County case and jury verdict illustrate several important topics, including cases in which several parties share liability in causing workplace accidents, workers’ compensation and the liability of third parties in workplace accidents. The case (Rosa Gonzalez, et.al. v. Atlas Construction Supply – L.A. Superior Court Case No. BC 507755) involved a man who was killed while working on a construction site in 2011. On Aug. 2, 2011, a 30-year-old man was working at the Hyperion Treatment Plant, a wastewater facility located in Playa del Rey that handles the municipal water for the City of Los Angeles. The city commissioned a construction project at the facility, hiring USS Cal Builders as the general contractor for the work to replace a gas compressor facility that was 60 years old. USS Cal Builders hired Atlas Construction Supply, Inc. to build the concrete walls using concrete forms. The man, who was employed by USS Cal Builders, was standing on top of one of the forms when it collapsed, causing him to fall 30 feet to the ground. A portion of the wall collapsed on top of him, causing a catastrophic head injury. He was killed in the accident, and his family filed a lawsuit against Atlas Construction Supply, Inc. The plaintiffs alleged that Atlas Construction Supply, Inc. negligently caused the accident and Mr. Gonzalez’s resulting death by using unsupported wall forms. Because of the lack of proper supports for the panel, the family argued that it collapsed, killing the man. They called several experts to testify at trial, including an economist, a general contractor and a structural engineer. The defendant argued that it was not liable for the accident. Instead, it placed blame on the City of Los Angeles, USS Cal Builders and the operator of the crane who placed the form in its location. The defendant also called several experts to the stand, including an economist, a structural engineer, a general contractor and a crane operator. The plaintiffs demanded $8 million as their final demand before trial, which was the amount of Atlas’s insurance policy limits. At mediation, Atlas offered $200,000. Before trial, the company extended an offer of $1 million. During the trial, the company extended an offer of $2 million. Finally, before closing arguments, Atlas offered $3 million. The trial lasted for 12 days. Upon deliberation, the jury unanimously agreed as to liability. The jury assigned 55 percent of the liability to Atlas and 45 percent to Cal Builders. The family had earlier reached an agreement with the crane operator, settling that matter for $600,000 before trial. The gross award by the jury was for $26,953,169.50, with $23,500,000 of that amount for noneconomic damages and $3,500,000 for economic damages. The net amount the family was awarded from Atlas was $16.3 million. Workers’ compensation laws in California provide that people who are injured while working on the job for their employers may not sue the companies for whom they work. In exchange, they are able to file for workers’ compensation benefits regardless of whether or not they were responsible for causing their own accidents or if their employer was at fault. In this case, the decedent worked for USS Cal Builders. Even though the jury assigned 45 percent of the liability to his employer and the City of Los Angeles, the family will not be able to recover that portion of the award because of the employer’s immunity from civil liability for workplace accidents. The family can recover monthly benefits payments that are designed to replace a portion of the man’s income. Even if an employer is immune from liability for a wrongful death or personal injury that occurs while the worker is on the job, third parties that are involved and that share a portion of the fault will be responsible for paying the portion allocated to them. In the man’s case, Atlas was a third-party subcontractor hired by the man’s employer. Since he did not work for that company, his family was able to sue Atlas in a wrongful death action. Because the jury assigned 55 percent of the fault to Atlas, the net award amount the family will receive is $16.3 million, which is 55 percent of the total gross verdict. 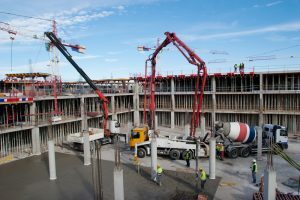 If your loved one has been killed in a construction site accident or you have suffered a serious personal injury in a worksite accident, you may want to consult with a construction site accident attorney. A lawyer may review what happened in order to determine whether or not any third parties might share some responsibility for causing the accident. If they do, the attorney may then file a civil lawsuit, naming all of the potential defendants. Contact a construction site accident attorney today to learn more about the rights you have in your own case.